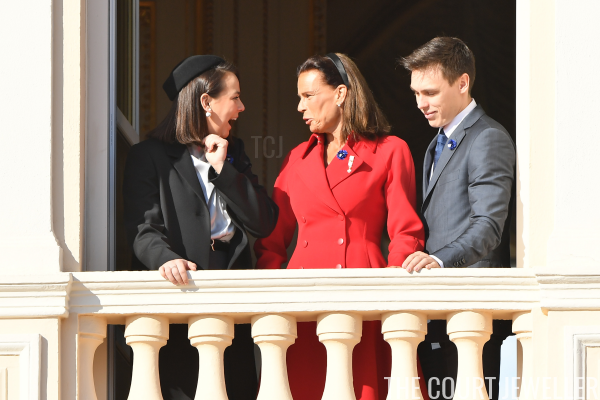 The Grimaldis of Monaco celebrated the principality's National Day on Monday, and the ladies of the family brought out some lovely jewels for both the day and evening celebrations. Princess Charlene brought out a favorite pair of earrings: the pearly Tribale style from Dior. ...and her diamond engagement ring on her right hand. 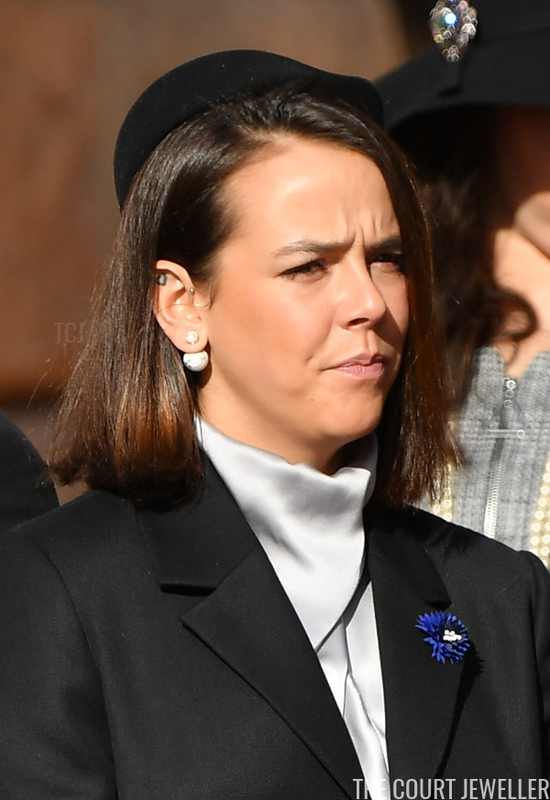 Princess Caroline wore large red earrings that coordinated with both her nails and the lining of her coat. She also wore a gold bracelet, a gold watch, and a ring on her pinky finger. 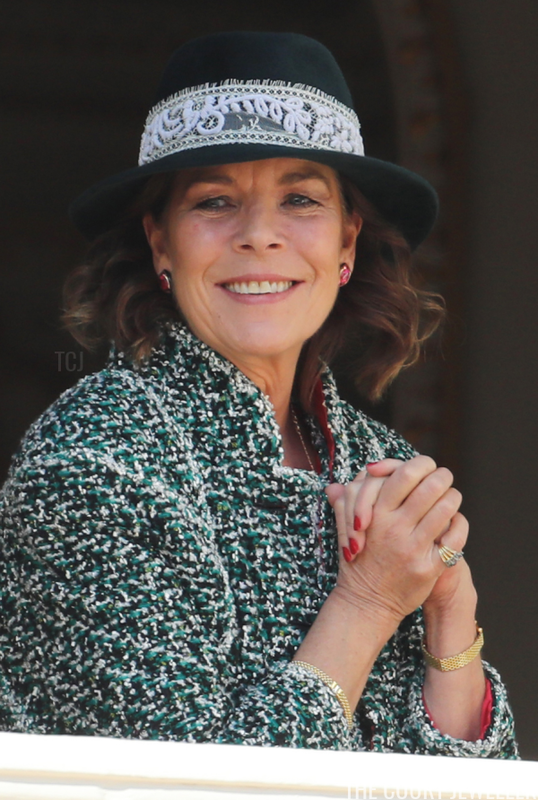 Princess Stephanie wore two pairs of diamond stud earrings, one smaller and one larger. 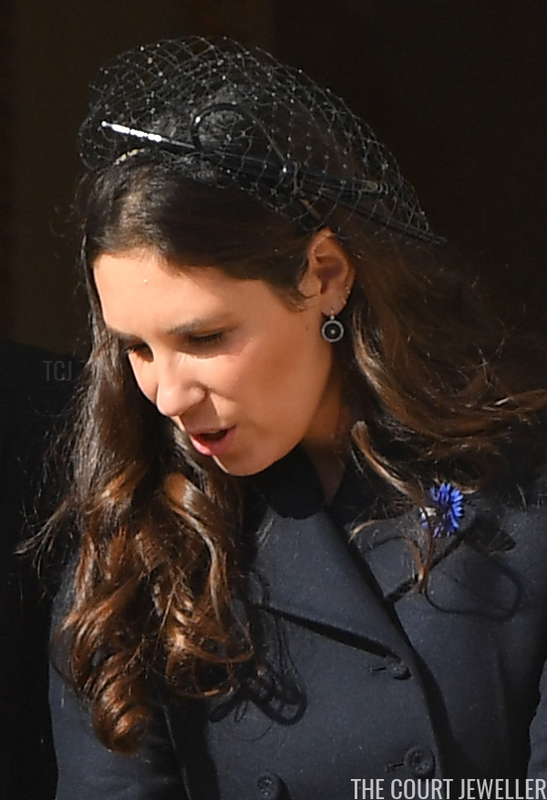 Tatiana Casriaghi wore earrings with circular drops that paired nicely with her neutral navy coat. Beatrice Casiraghi was the picture of Italian glamour in gray pearl drop earrings and tortoiseshell sunglasses. She also wore rings on each hand and a slim Cartier Love Bracelet on her right wrist. 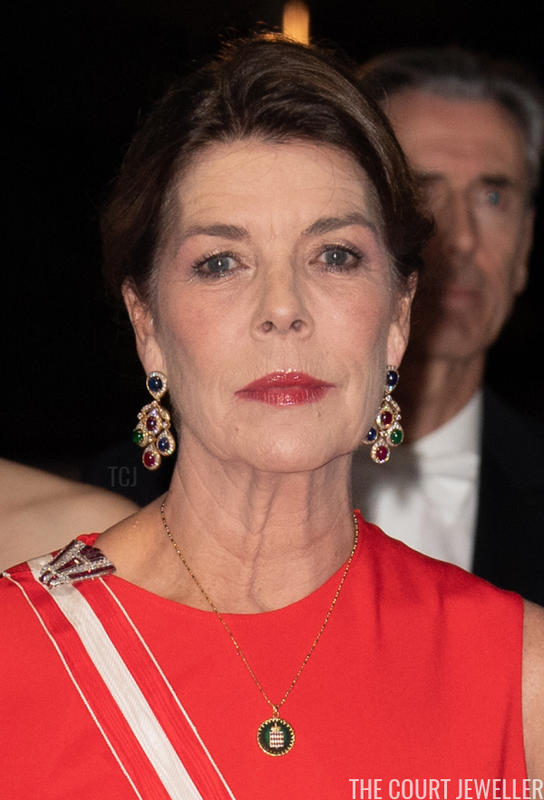 Princess Alexandra wore a pair of elaborate stud earrings and a classic necklace. 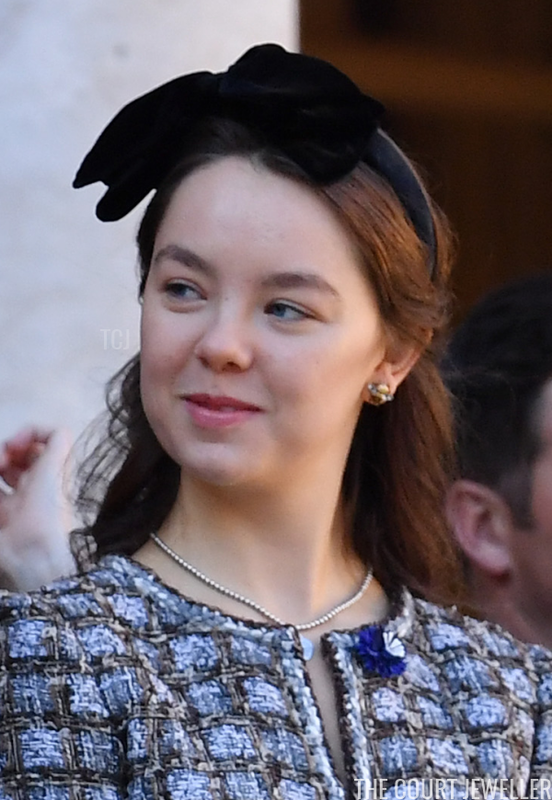 Like her mother, Pauline has multiple piercings in each ear, and she wore a trendy array of earrings, including a pair of Dior Tribale earrings with a marble pattern. But the stars of the show, as always, were the Grimaldi kids! 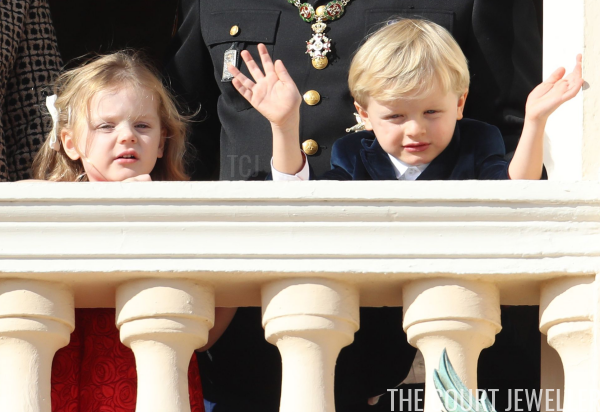 Hereditary Prince Jacques and Princess Gabriella were adorable as they joined their parents on the balcony. As were the Casiraghi kids! Helpfully, their parents color-coordinated them. Pierre is holding his elder son, Stefano, while Andrea's elder son, Sacha, stands in front of his grandmother. 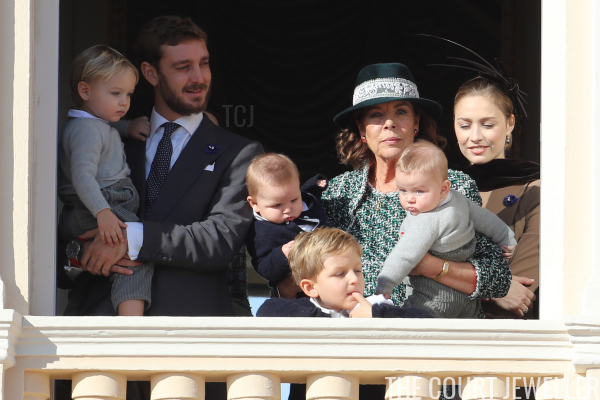 Princess Caroline is holding Maximilian Casiraghi (Andrea's second son, wearing navy) and Francesco Casiraghi (Pierre's second son, wearing gray). The babies were born a month apart this spring. 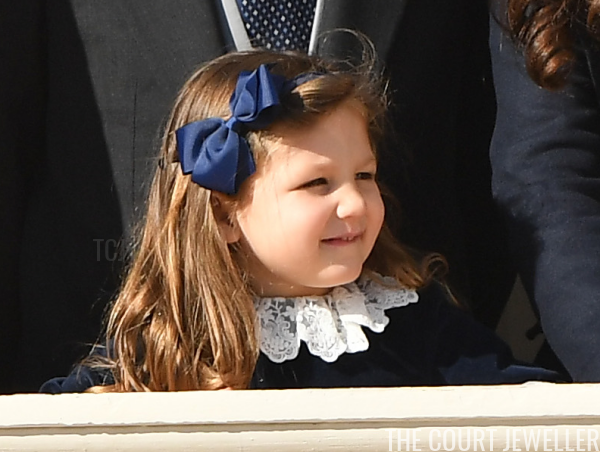 Also adorable in navy: Andrea's daughter, India Casiraghi, who stood with her parents on the balcony. 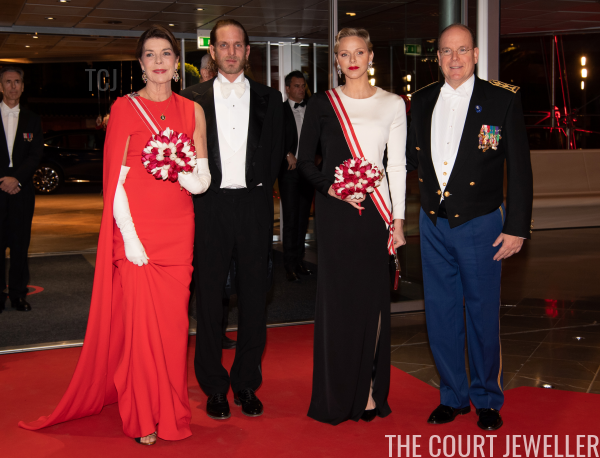 On Monday evening, the family gathered for the annual National Day gala. 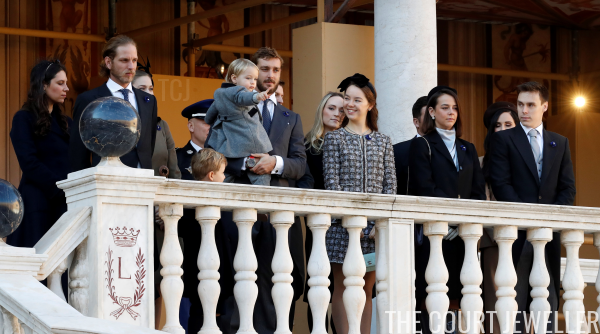 Prince Albert II and Princess Charlene were accompanied by Princess Caroline, who was escorted by her elder son, Andrea Casiraghi. 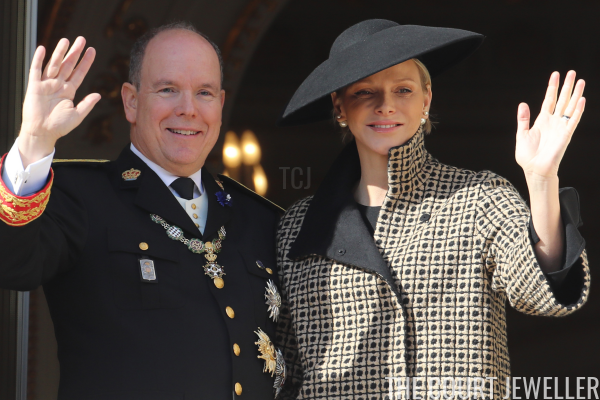 Princess Charlene's primary accessory was an intricate pair of diamond statement earrings. 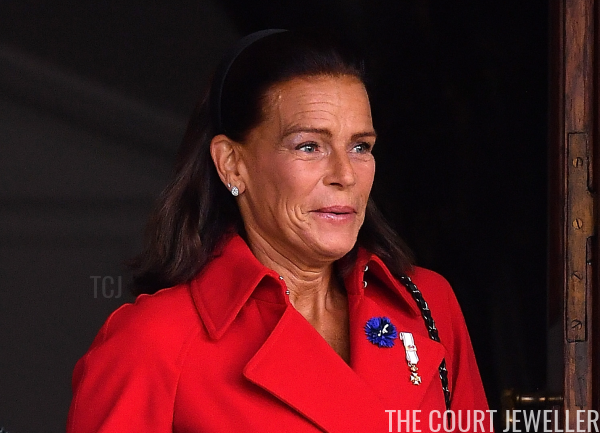 Princess Caroline wore familiar jewels: her diamond, ruby, sapphire, and emerald earrings, a diamond and ruby clip brooch in the shape of the letter A, and a pendant emblazoned with the Grimaldi family crest. Photographers also snapped Beatrice Casiraghi arriving for the gala. She paired golden pearls with her champagne-colored gown.